I have to tell you that I had only visited IKEA once or twice when my girls were going to college in Boston, and they were always quick trips to pick up supplies for their dorms, but once we moved to Illinois and I was able to really look around, I found out that IKEA was so much more than a college dorm superstore. Now, 4 1/2 years later, I have a pretty good handle on the different departments and the items I’ll go back for. I don’t visit our local store as often as I did when we first moved here, it’s usually too crowded, but when I do I always come out with something I love. So what’s the best things at IKEA? I’m sure everyone has their favorites but these are my top 10 favorite finds. Actually, I recently took a trip there trying to find pillow covers for my winter decor and, once again IKEA didn’t disappoint. They always have a great selection and the prices can’t be beat. For someone like me, who changes pillow covers with the wind, it’s a no-brainer. 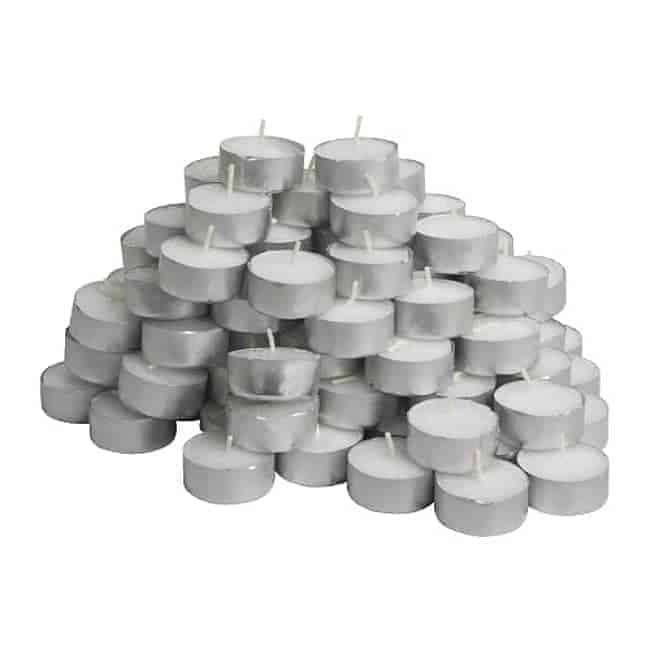 I burn candles and tea lights all the time, especially in the winter, so finding these has been a real money saver, a pack of 100 is only $3.49. 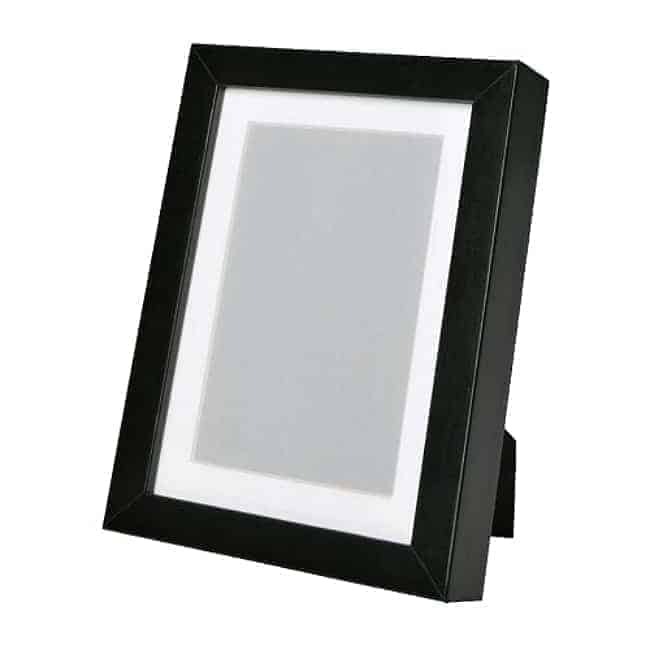 I love a simple black frame and the Ribba is just that. I have them sprinkled all around my house hanging with more expensive frames and you can’t tell which is which. Ok, I don’t have one of these, but I look at it every time I go and imagine all the goodies I could put in it. We have a small house and I really don’t have anywhere to put it so this one will have to live in my dreams…for now. Actually, my daughter turned me on to these, she uses them for all of her kitchen storage. I bought several to help organize our stash of nuts in the kitchen (ummm, we’re nuts for nuts 😉 ). 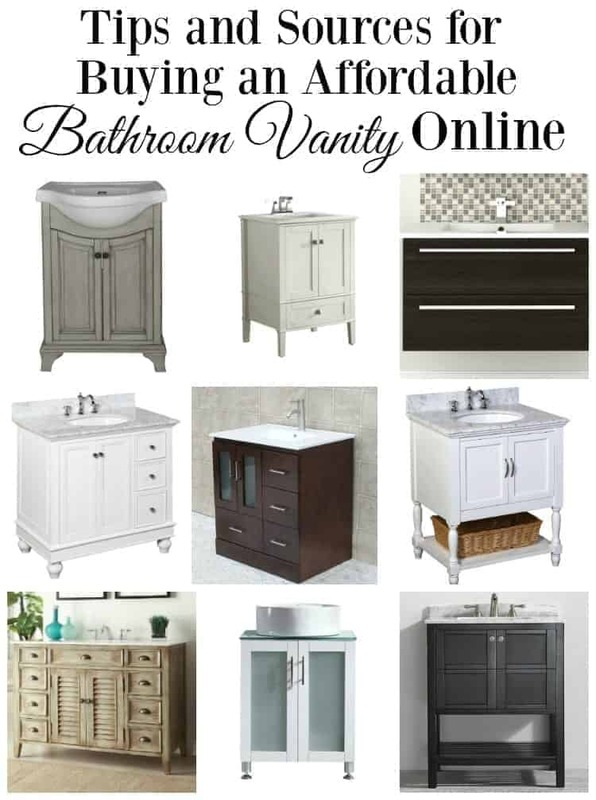 They have several different sizes, a tight seal and the prices are awesome. I bought one of these a few months ago to use in the bedroom, once I give it a makeover of course. I love that it’s made of solid wood, it’s inexpensive and it’s a blank slate. You could do so much with it (or leave it as is). I’ve since completed my Rast hack. You can check out what I did to it and how I’m using it, here. I literally looked everywhere for a kitchen sink that fit our small space and didn’t break the bank and IKEA had exactly what I wanted. I love it! I love my throw from IKEA and it’s gets a lot of use in our house. Not only is it 100% cotton but it has some weight to it and washes well. This is something else I’ve admired but not gotten. When we were looking at lighting for our kitchen, IKEA was the first place we looked. I loved this pendant but, sadly, it’s too big for our space. It’s a great looking light, though. Before we started our kitchen reno we would brave the crowds and browse around all of the beautiful kitchen spaces looking for inspiration and ideas. It really helps to look at different spaces to get an idea of what you like and don’t like and this was just the place. If you’re thinking about a kitchen reno, or just want something to do on a Sunday afternoon, I highly recommend a trip to IKEA’s kitchen area. 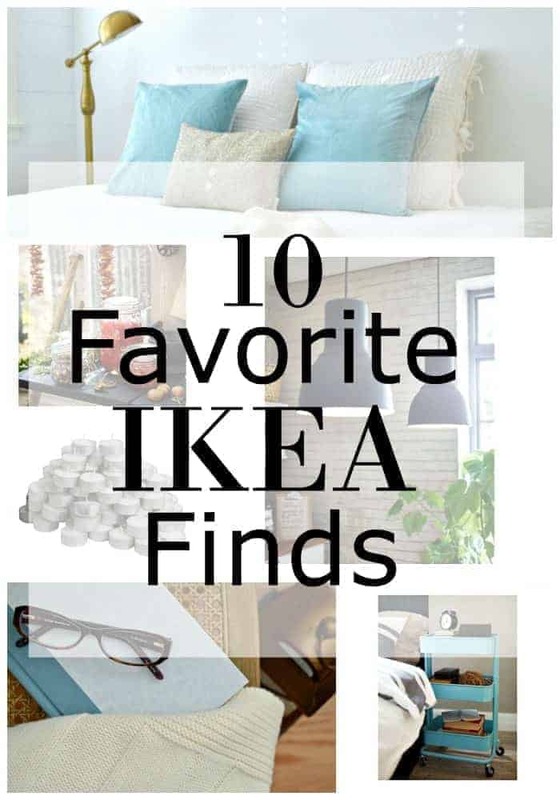 What are you favorite finds at IKEA? Are any of my favorites yours? I have not been compensated for this post. I just wanted to share some awesome finds with you. 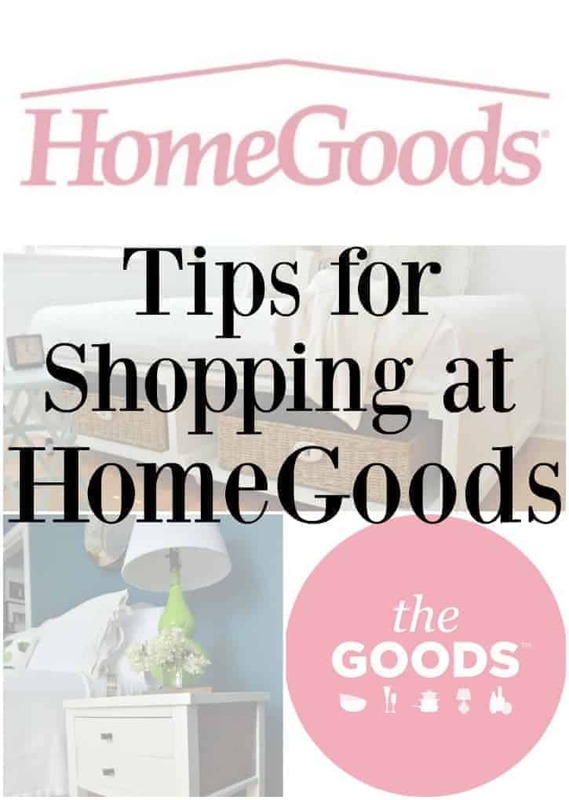 Another favorite place that’s filled with awesomeness is HomeGoods, and I’ve shared some tips for shopping there. I love visiting Ikea. There are 2 in Toronto, Canada. My favourite and the most useful thing I got was a Pax wardrobe many years ago. So much that I bought 2 more in the next few years. They are 6’x3’x2′. I have one in the office to store supplies and toys for the grandkids. One is in the basement that holds all the christmas decorations, hobbies and sleeping bags. The best is in the kitchen and used for holding my pots, pans, baking cookware, small appliances and dry goods. 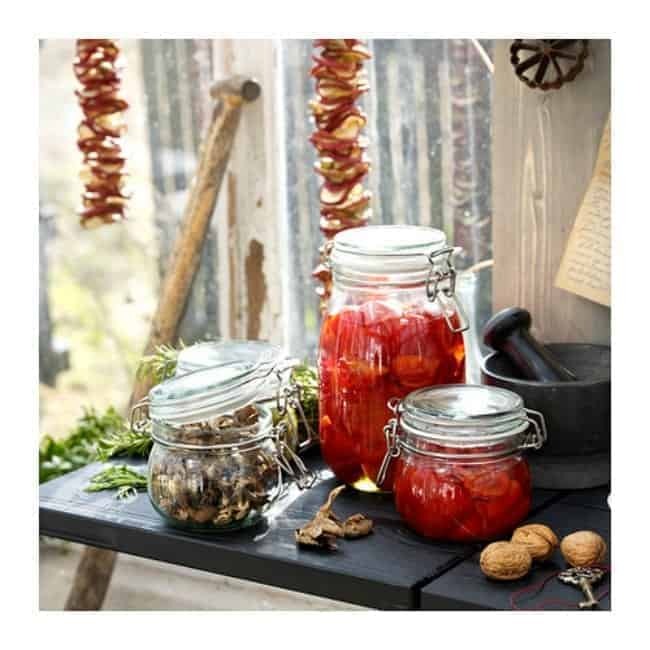 Those are stored in various sized glass storage jars like you have. I used their step stools for my old dog who couldn’t climb into the car or the bed and was too big to lift up. I still use the for an old rescue dog who is too small to jump up. Over the years I’ve bought many things from them. Storage things, office stuff, lighting, baskets, dishes, christmas decorations and so much more. I can’t wait for the christmas decorations every year. Always something new to see. Their restaurant is great too. I just discovered your site and enjoying going through it. Beautiful chriatmas decorated guest room. Hi Karen and welcome to Chatfield Court. So glad you found us and stopped in for a visit. It sounds like you are a huge fan of IKEA too and have found pieces that you use and love. Thanks so much for sharing your favorites. I’ll definitely check out the Pax wardrobe on my next visit. Tea lights are my favourite purchase at Ikea too!! I am an Ikea fan as well, I have that same throw! Most of my furniture is from Ikea, my favorite piece is my two person chaise lounge. The affordability of the textiles is great too, it makes redecorating easy (and possible) on a budget. I love IKEA! We have a new one opening in our town in just a few weeks, and I can’t wait! Great finds! Oooo, lucky you, Tracey! Enjoy your new IKEA! When I get the chance I love heading to Ikea. 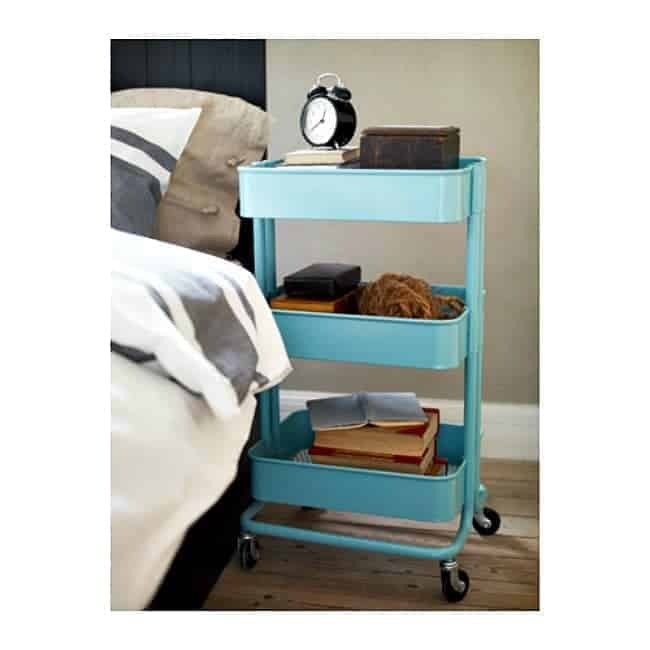 I love carts for organizing. Thanks for sharing at the Inspiration Spotlight party. Shared. Love all these pics. I need to make a trip there soon! I love Ikea but unfortunately there’s not one anywhere near my home. I did get to go for the first time the last time I was in Denver and it’s really a good thing there’s not one near me because I might just decide to live there. They have food and everything! It’s truly an amazing place to shop and I cannot wait to get to go there again one day. For now, I will just have to order online. Thanks for sharing your post at the Family Joy Blog Link Party this week. Please join us again next week!! We are lucky enough to have an IKEA here in Charlotte!! I always stock up on batteries when I am there. Also, they are a great spot for wrapping paper at Christmas. The rolls are fairly cheap and last forever!!! I agree Dara, I always stock up on batteries too. I haven’t checked out the wrapping paper though. I’ll definitely look into that next Christmas. 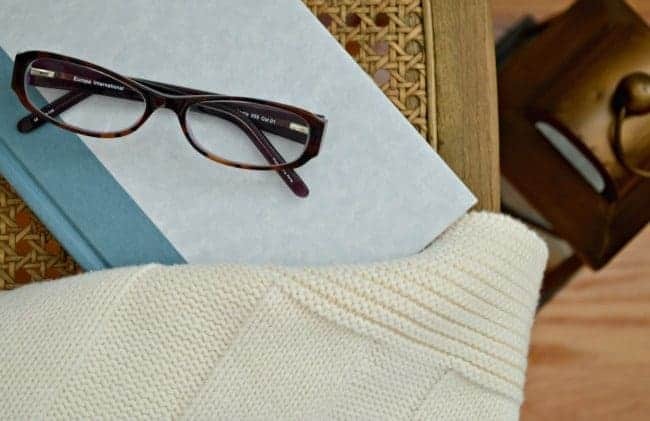 Thanks for sharing your favorite finds. What I love about IKEA is their simple, creative design that goes into every item. For instance, many years ago I bought the simple plastic and paper bag holders that simply snap together and are hung on the wall. I put them in my pantry so that when I empty bags I put them in the containers. When they accumulate, I recycle them or give them to the local food bank. Simple product but clever and so efficient- and cheap!!! Hi Jen! You are so right about IKEA’s simple and creative designs. Those bag holders are awesome. 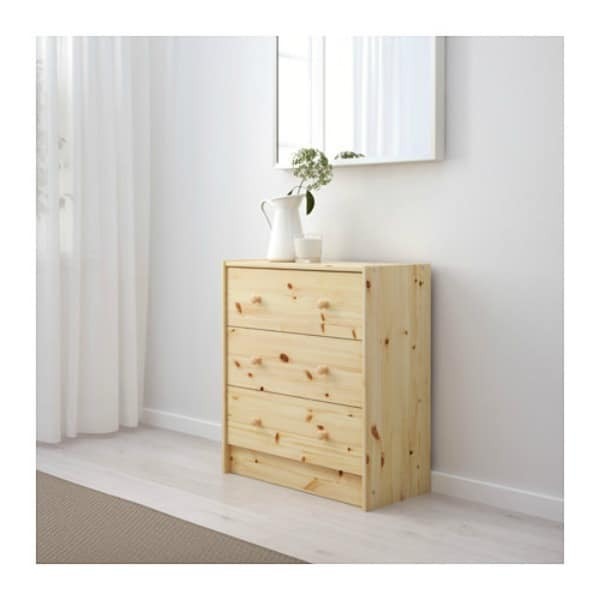 Thanks so much for sharing your thoughts about IKEA and this great product! I love that sink too. I am from South Africa where we don’t have an IKEA but I have been lucky enough to shop in the Dubai store and Italy. I have found that Ikea has stuff you never knew you really needed. Hi, Lyn! That’s too bad that there is no IKEA in South Africa but I’m glad that you were able to experience their awesomeness. 😉 You are so right about shopping there, though, I’ve walked out of the store many times with stuff that I never knew I needed. Thanks so much for stopping in to visit. Thank you for your list of Ikea finds. I’ve added many to my list. I love Ikea even though for me its 230 miles away. 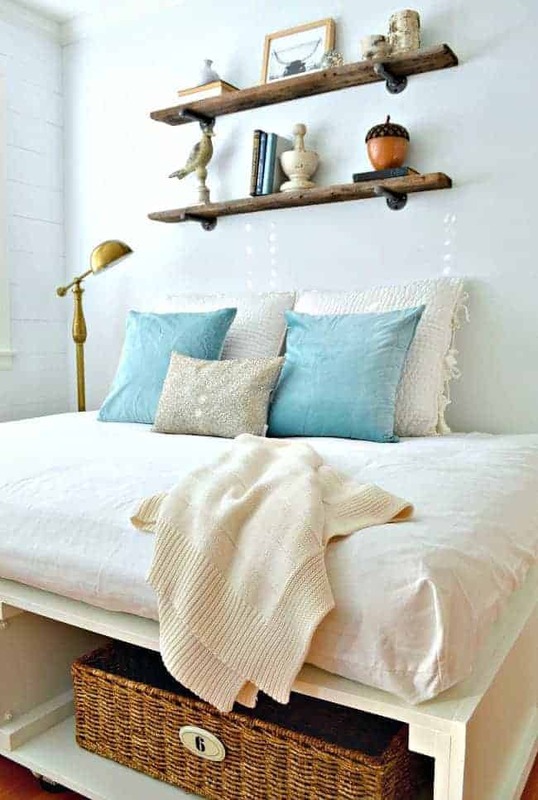 I love the little Fixa kits that you can stack neatly on a shelf in the utility room or garage, the bedding, the affordable outdoor furniture and rugs, the lighting, and all of the bins and baskets and drawer and shelf organizers. Oh I could go on and on. I too buy their Ribba frames, and I have the utility cart in my coat closet which I use to store frequently accessed files, printer paper, and notebooks since the office is upstairs. It takes up very little space and I can just wheel it out to file and then put it back. If an Ikea ever opens here I would love it! We are getting a Home Goods soon, so I’m going to check out your list for that store next! Thanks! Love the utility cart!! It would be a great nightstand in my daughter’s room. I am redecorating my entire home (crazy, I know) . I started with my daughters room and used spice racks from Ikea to create a reading nook for her. I did live near an Ikea for years but we moved you years ago and the closest one is just too far so I order on line. They cost 3.99 each ! Bought spray paint at Home Depot and presto!!! I would love to post the pic but not sure how to do that. Love your blog!! Isn’t that utility cart awesome Katherine? That’s a great idea to use it as a nightstand. It sounds like you have gotten very creative with your IKEA finds, good for you! I’d love to see your pics. If you want, you could email them to me at [email protected]. Thanks for stopping in and for sharing your ideas. Have loved IKEA since it opened 2004. If we lived close ,I would volunteer there. Thank you for IKEA . Maybe you could work on clothes. Just asking. IKEA is an awesome store, isn’t it Sara? Thanks so much for stopping in and, you never know, maybe one day I’ll do a post on clothes. I love Ikea! I also have that sink! Isn’t it great!?!?! I don’t think there is a room in my house that doesn’t have something from the store and the list grows every time I go. One of my favorite things to get is their cheap (and I mean cheap, like $.79 ea) kitchen towels. I use them in my kitchen of course and bleach them. Then, when they are stained I don’t feel bad about passing them down to be floor towels. Once they are too stained for even floor towels they get tossed or sent out to the garage. Another one is the package of kids washcloths. They are white except for the little loop so, I can use them in my kitchen with the same cycle as the kitchen towels. I don’t remember how much they cost but it is less than a $1 per cloth. I also forgot to mention above, when they are demoted to floor towels I cut the loop off and then there is no way of getting them mixed up. Wow 3 hours to shop at IKEA, that’s love. 😉 Thanks so much for sharing your favorite IKEA finds! I’m definitely going to check out the towels and the washcloths. I’m always looking for things like that. Oooh, I need that utility cart. I have a spot where extra kitchen items like water bottles and extra snacks just pile up and that cart would be a great place to store them. Thanks! Isn’t that cart awesome? It sounds like it would be a great addition to your kitchen. Thanks so much for visiting. Those are some great things. I haven’t been to an Ikea in years and I’m not even sure where the one is here LOL It’s far away… that much I know. Thanks so much for the head’s up Rue, I appreciate it. I had no idea, probably because I know zero about Blogger. I think I fixed it…hopefully. Have a great weekend! I agree with you on all points Kristi! And since I have been there several times lately (for a project I’ll be sharing soon), I have accumulated so much stuff from there already! I know what you mean Vel. It’s so hard to go into IKEA and not come out with something good. Can’t wait to see what your working on. Wish we had an Ikea store near us. Looks like they have some great things! 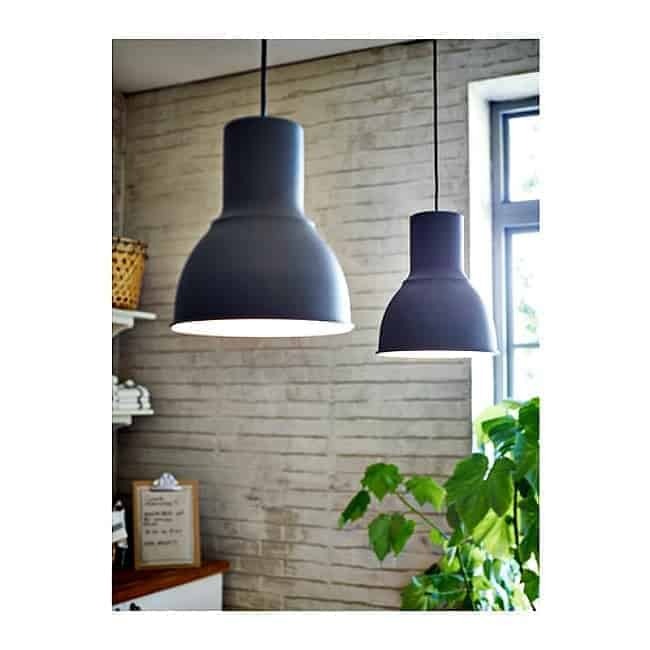 Wonderful picks from IKEA… I am a HUGE fan of IKEA and lucky enough to have a store in my city. I renovated an older home 2 years ago and t every room in my home has items/furniture from IKEA. I used their free kitchen designer to put my kitchen together. The designer was phenomenal and helped me get a ton of storage into a 8′ X 10″ space. One of my favorite ways to spend an afternoon is to go and just walk around the store… I always come out with new ideas. So sorry Peppi. The issue has been fixed. Thanks for letting me know. Ikea is one of my favorite stores and so many, many pieces in my home have come from it! We were just there a few weekends ago and came home with a chair, some hand towels, a new cutting board, glasses and a pasta strainer! It’s alway fun to poke around, isn’t it? It is a fun place to poke around. I love to come away with a few ideas, and maybe a few great finds. 😉 Thanks for stopping in Kim. I’ve bought very few things from IKEA, and have only been I believe twice. But one of my most favorite kitchen supplies came from there – my cheese grater! It’s the Chosigt, and I love it and wish I had another (we eat a lot of cheese, ha!). Only reason I’ve kept my regular grater is because I actually do need multiple graters – I use one about five times a week! Hey, everyone needs a cheese grater, or several, right? Fellow cheese lover so I totally understand. 😉 Thanks for stopping in Jessica and I hope you have a great week! I’m sorry that you had trouble opening the HomeGoods post Debbie. The problem should be fixed. I think that cart would be an awesome addition to your quilting studio. You might be able to get one in your car. I think it comes unassembled and in a box so it just may fit. I totally agree with you, Ikea has so much more then dorm decor. 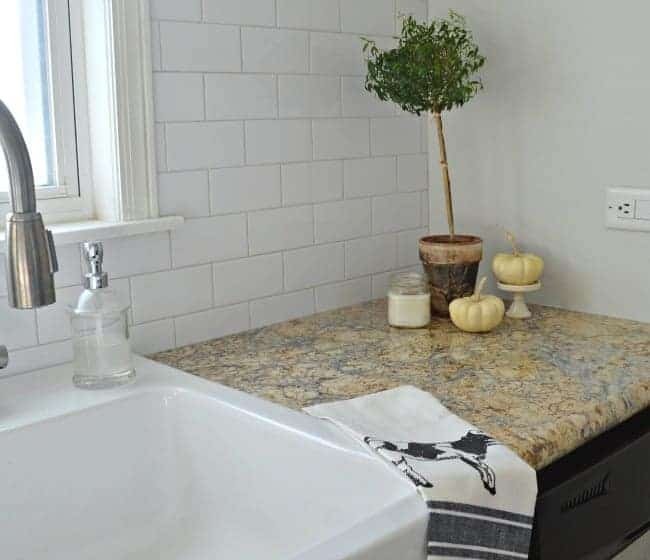 We also purchased that farmhouse sink from Ikea and my talented husband mounted it under our oak counter tops (also Ikea). Actually our whole kitchen, cabinets, appliances, counter tops and sink, came in under $7000. We couldn’t be happier. 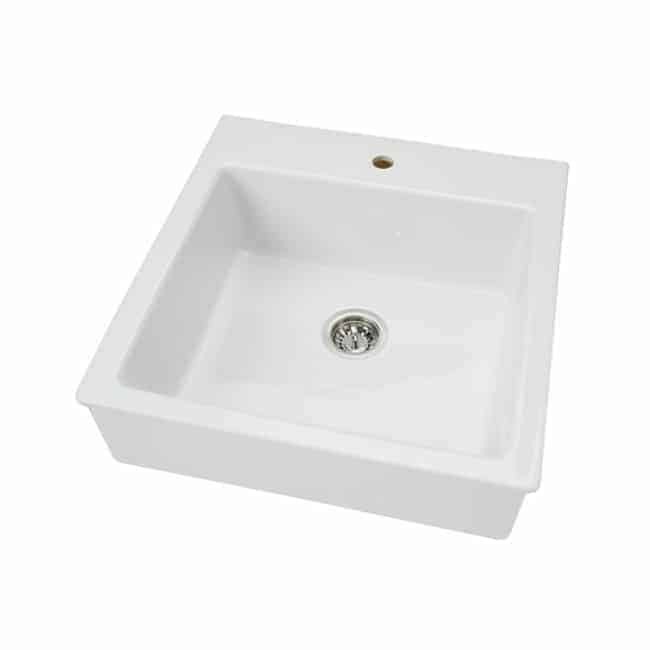 The farmhouse sink is awesome, isn’t it? Wow, $7000 for a whole kitchen reno, including appliances, is awesome! Congrats to you and your hubby. Enjoy!